Unless we put medical freedom into the Constitution the time will come when medicine will organize itself into an undercover dictatorship. To restrict the art of healing to doctors and deny equal privileges to others will constitute the Bastille of medical science. All such laws are un-American and despotic. namely, that the art and science of healing should be restricted to a select class of allopathic physicians, who have the sole legal right to recommend and administer medicines, and whose pharmacopeia excludes - as a matter of principle - all the healing foods, vitamins and herbs which have been used safely and effectively for countless millennia in the prevention and treatment of disease. We have entered an era where medicine no longer bears any resemblance to the art and science of healing. The doctor no longer facilitates the body’s innate self-healing capabilities with time, care, good nutrition and special help from our plant allies. To the contrary, medicine has transmogrified into a business enterprise founded on the inherently nihilistic principles of pure, unbridled crony capitalism. The "medicines" themselves are often devoid of intrinsic value, being nothing more than rebranded and re-purposed chemicals, intended (though all too often failing) to be administered in sub-lethal concentrations. Indeed, many of these chemicals are too toxic to be legally released into the environment, much less be administered intentionally to a human who is already sick. You need look no further than a typical drug package insert to find proof that the side effects of most drugs far outnumber their purported beneficial effects. These chemicals are so highly leveraged against their true value, that they often sell for as much as 500,000% percent from cost! Only medical/pharmaceutical and financial institutions (e.g. Federal Reserve) are legally empowered to generate the illusion that they are creating something of value out of nothing of value, on this scale. 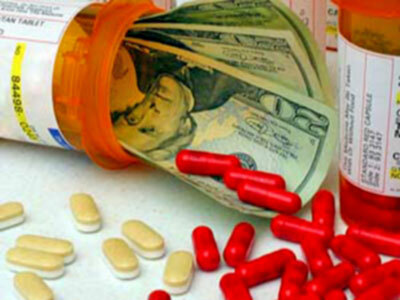 This manipulation of perceived value, which is the basis for the global dominance of the drug-based medical model, is not unlike how financial institutions create toxic derivative products, essentially creating the illusion of financial well being and prosperity, at the very moment that they are planting the seeds of death within the global economy; ruining the lives of countless millions in the process. Within the present dominant medical system, healing has not simply been forgotten, but intentionally exorcized, as it represents the antithesis of perpetual profitability which requires the incurability of the human body. Were the truth to be told, and the body’s self-regenerative capabilities acknowledged, the entire superstructure of drug-based medicine and hundreds of billions of dollars in revenue it generates annually, would crumble overnight. When a handful of turmeric has more chemotherapeutic activity than any drug yet to receive FDA approval, or an enzyme from pineapple is superior to a 40-year-old blockbuster chemotoxic agent, one begins to understand why the hundreds of studies proving natural substances can destroy cancer are never discussed. You can’t compete with free, effective and safe in a medical marketplace dominated by expensive, ineffective and unsafe. If this degeneration into quackery and snake-oil salesmanship, which is modern drug-driven medicine, were simply a lesson in what bad things can happen when health care is no longer a basic human right but strictly a profit-driven commodity, perhaps Americans could find it within themselves to once again free themselves from the shackles of oppression. After all, do we not consider ourselves the very originators of freedom, independence and democracy? Have we not such great faith in these principles that we practically trip all over ourselves (crushing entire countries as we fall) in our Promethean effort to export these values overseas whether we are invited to do so or not? Would we stand for less when it comes to our own health freedom? Sadly, the “undercover dictatorship” Benjamin Rush foretold is not simply a homegrown one we can root out from the inside, as it were. Although the American Medical Association (AMA) and the Food and Drug Administration (FDA) behave as if they are at the top of this pyramid of power relations, they serve far lower in the hierarchy. While the United States government and American corporate lobbying groups may appear to be behind the FDA’s shameless pandering to the interests of the drug companies, transnational corporations and organizations - and the few steering them - are in fact pulling the strings. The United States no longer enjoys global economic and cultural hegemony. We are now embedded in an international playing field where multinational and transnational organizations like the drug company Pfizer, or the World Health Organization (WHO) and the World Trade Organization (WTO) have power and influence that overshadows the US or any other particular government or nation-state. These larger organizations blur the divisions traditionally drawn between public and private institutions, insofar as their agendas and mandates are consistent with global economic imperatives that do not account for the self-proclaimed sovereignty of any particular nation-state’s Constitution or laws above its own. For example, the United States may soon no longer be able to allow the over-the-counter sale of dietary supplements if the World Trade Organization decides it violates our membership agreement to do so. This process known as Codex Alimentarius is already quite far enough along, with prescription-only vitamins already making it onto the market, and herbs like ephedra (and cannabis long before it) having been classified as illegal drugs. At the end of times the merchants of the world will deceive the nations through their Pharmacia. Given this unseemly state of affairs, some believe we are on the precipice of a medical end-of-times or “Pharmageddon," if you will, where medicine is no longer directly associated in any way with healing, but rather is a form of mass control and a highly organized means of simultaneously defrauding the public of its wealth and health. After all, is there any greater absurdity than a medical model that treats the symptoms of disease with sub-lethal dosages of toxic chemicals and in which there is no attempt to uncover, understand or remove the causes of those imbalances? Then why would anyone consider it sound practice to use potentially toxic chemicals as a first-line treatment for conditions that are not caused by a lack of a chemical? To the contrary many diseases are caused exactly by culminative exposure to toxic chemicals that not unlike drugs are biologically alien to the body. We are treating poisoning with poisons! Can we dignify this approach by calling it medicine? Or, is it more accurately described as a form of sorcery? The sole reliance on Pharmaceuticals reveals quite a lot about the agenda underpinning modern medical practice. “drug, poison, potion, charm, spell, enchantment." A Pharmakós (Greek: φαρμακός) in Ancient Greek religion was a kind of human scapegoat (a slave, a cripple or a criminal) who was chosen and expelled from the community at times of disaster (famine, invasion or plague) or at times of calendrical crisis, when purification was needed. The term "pharmakos" later became the term "pharmakeus" which refers to "a drug, spell-giving potion, druggist, poisoner, by extension a magician or a sorcerer." A variation of this term is "pharmakon" (φάρμακον) a complex term meaning sacrament, remedy, poison, talisman, cosmetic, perfume or intoxicant. From this, the modern term "pharmacology" emerged. One no longer has to look to religion for the absolutist claim to truth. Medical science has laid claim to the body in the same way that religions once laid claim to the soul. The physician today - albeit a glorified "applied pharmacologist" - has become the "priest of the body," capable of influencing the course of life or death by the quality, or combinations, of nostrums (s)he is able to apply to the problem (i.e. patient) at hand. Just as monotheism depends on there being "one God," modern medical science depends on the "evidence-based" concept that there is one truth, and one right way to apply it. This, by implication, gives absolute power to those who would claim to know the difference. In Benjamin Rush’s time, the medical dictatorship of which he spoke had not yet come to pass; and though magical potions like mercury and questionable techniques like bloodletting were used in colonial times, herbs were still considered and employed as legitimate medicines. Even if many wise women herbalists were eliminated as competition by being branded witches and sometimes murdered, the herbs themselves were not categorically demonized because no vast armory of pharmaceutical drugs had yet been created to supplant them. The herbs and foods themselves have now been both vilified as dangerous, and lampooned as completely ineffectual, generating the ridiculous contradiction that we are supposed to be dumb enough to accept as truth: namely, that they are both impotent and unsafe. Given these circumstances, confidence in the safety and efficacy of natural substances in the prevention and treatment of disease has not only waned, but the positive association between food and healing has been outright denied by medical authorities. It is illegal for non-doctors to make health claims for natural substances even if thousands of years of use in folk medicine and a vast emerging body of scientific research now confirms their benefits. You can’t say cherries cure gout even if it is true. (Truth is no longer the criteria that decides what you can or cannot say; rather, it's who profits more from the information being freely disseminated or censored). I started the website www.GreenMedInfo.com in August 2008 in order to provide free and convenient access to the massive amounts of research that have accumulated on the health benefits of natural substances over the past 50 years. The government database known as Medline (which is freely searchable) contains over 18 million biomedical citations from over 5,000 scientific journals, many of which focus specifically on the therapeutic action of foods, vitamins and spices on serious, even life-threatening disease.